Dream about landing a spot on the front page of Google? On-page SEO is a powerful weapon in any freelance business owner's arsenal. It’s the practice of optimizing your blog posts and website pages to rank higher and win more traffic from search engines. Yup. 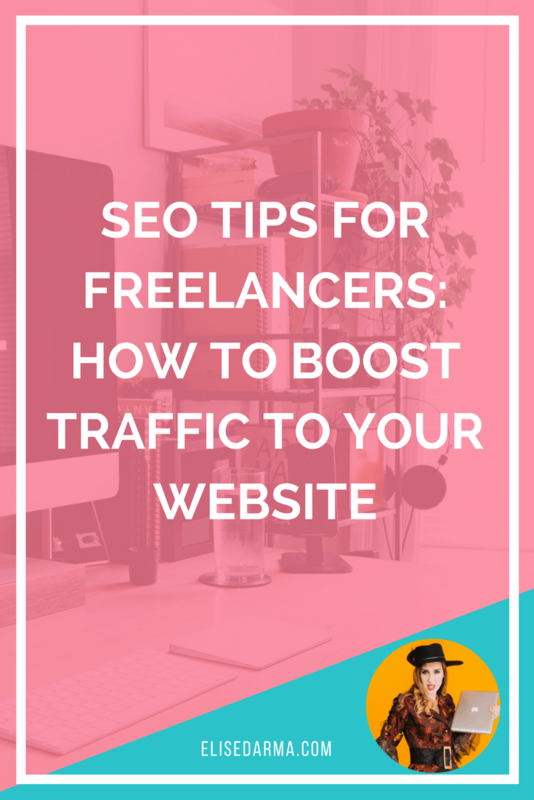 Learning a few SEO tricks will help you get more exposure for FREE, be seen as an authority in your industry, and bring in leads that are ready to do business. If you're struggling to get onto Google's good side, I've put together 9 of the best SEO tips for freelance business owners. Write that down and underline it twice because trust me, you don't want to forget it. Do your best to get your targeted keyword in the beginning of your title tag. The title tag is the name of the page or your blog post. It will tell Google the topic of the page and help to boost your page or post up the rankings, and you'll be on your way to ruling the search engine results. The title of your website can also have keywords in it. For example: instead of calling this website just ‘Elise Darma,’ it's titled as ‘Elise Darma | Instagram Marketer + Freelancer.’ This creates another way for potential readers, customers and clients to find me via search engines using those keywords. Your URLs are not the place to be verbose and show off your vocabulary prowess. Keep em' short and keyword heavy. You should only need 5 to 6 words to get your point across. Otherwise, Google will think your URLs are long, clunky and hinder the SEO performance of your freelancing website. It doesn’t tell the user anything about the link. It’s not enticing in any way, and it doesn’t include any keywords. It’s short, gives the user and search engine information about the link, and includes a keyword phrase. Avoid using stop words (a, the, of, for). These are usually filtered out by Google in a search query. Make sure your URL is easy for people and search engines to understand by making sure the topic of the page is clear. Your target keyword is front and centre. Search Engine Journal has a handy ultimate guide for optimizing your URLs for maximum SEO effect. Make sure you include your target keyword in the post and wrap it in an H2 tag (in Squarespace, this is known as Heading 2) to boost your way up the search rankings. H2 tags (like the title of this very section: 'Leverage The Power of H2 Tags') help to break up your content and make it easier for search engines and people to read. It’s also another place for you to use your targeted keyword to boost your SEO ranking. In WordPress, you’ll find the H2 heading option in the paragraph dropdown list. You’ll also find Headings 3 to 6 which can be used to help Google understand the structure of your page even more. In Squarespace, you'll want to highlight the text that you'd like to wrap in the H2 tag, and then choose "Heading 2" from the text dropdown menu. You want to mention your keyword within the first 100 words of your blog post or page. If you can get it into the first sentence, that's even better. From there, you want to include it a few times in the body of your text as well as keyword variations. All it means is using synonyms of your target keyword in the body of your blog post or page. This helps Google determine your page's relevancy, and it helps you catch people who are searching for the same thing in different ways. One of the best FREE tools to find semantic keywords is LSIgraph. Pop in your keyword, and you'll get a dozen options to include on your page or next post. It's an easy win-win that not many people are doing, making it an easy way to climb up a few spots in search engine results. Outbound links are where you link to other authoritative sites speaking about the same topic, but are not direct competitors. You want to back up any claims you're making on your page or post with data, and give your readers access to more information sources. This helps you build credibility as an industry thought leader, and it helps Google draw links between the two pieces of content. Website traffic, boat traffic... I want it all. For example: Below this section, I've linked to a blog post about the importance of site speed. Seeing as I'm not an expert on site speed, I don't have (and never will have) my very own blog post on that topic. So by including that source, I'm not linking to a direct competitor, but I'm sharing information that makes me look knowledgeable AND draws connections between my blog post and that authoritative outbound link. For internal links (meaning, links to content on your own site), make sure you add two or three to every post. Have you ever seen those “you might like” sections at an end of a blog? That’s a great way to keep visitors engaged and on your site. But if that's not your jam, you can also link to other pages or blog posts of yours in the text body of your post. Did you know that 75% of users won't revisit a site if it takes longer than 4 seconds to load? That's a first impression you don't want to mess up. Boost your site speed by compressing images and switching to faster hosting. Check your site speed for free with tools like GT Metrix. Don't name your images something boring like 123.jpg. If you do, you'll find yourself struggling to break out onto that first page of Google results. Before uploading your images, make sure the file name includes your targeted keyword. For a final one-two SEO punch, add your keyword to the "alt text" section once your image has uploaded onto WordPress or Squarespace. Yes, I would like my website to DO MORE for me while I sleep. Think nobody reads long-form content these days? We don't have the time to search multiple websites for answers to our questions. Websites that have all the information have a lower bounce rate, longer visitor times, and rank higher than short-form content. So how many words should you aim for? Start with a minimum of 1,000 and work up to 3,000+. Put in the extra time to answer all the different questions your readers have so that your post becomes the go-to guide on that topic. Plus, long and engaging content will boost your ranking for dwell time (a metric that calculates user engagement and session duration) and tell Google that the quality of your content is A++. 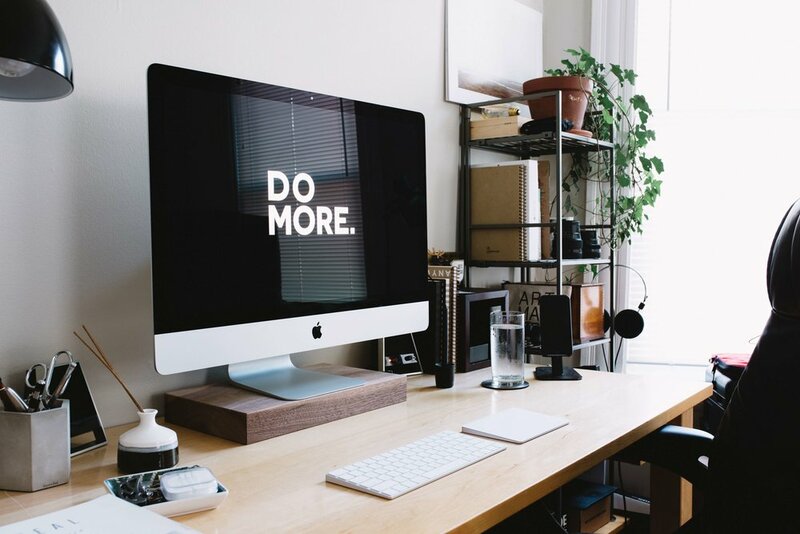 All it takes is a little bit of practice, and you'll have these 9 SEO tips memorized like the back of your hand in no time. How will you know your SEO tricks are working? I like to keep a spreadsheet with links to all my blog posts and their targeted keywords. I check their keywords usually on the 1st of every month by searching for them in Google. By then, depending on how hard the keyword is to rank for, I usually see an improvement. Ready to get that freelance business off the ground? Not sure how to start your own freelancing business or feeling overwhelmed by the endless to-do lists? Sign up for my Freelance Biz in a Box course, and I'll help you ditch all that overwhelm so that you have a clear-cut plan in place to be running your own freelance business within 6 weeks.